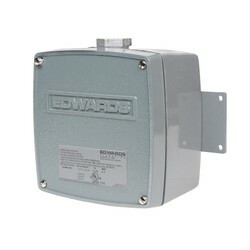 The Edwards 5540MV Adaptatone Millennium Central Tone Generator with Voice messaging has been designed for applications where simultaneous signaling of a high decible, heavy duty signal and pre-recorded voice messaging is required. The tone generator assures a synchronous signaling sound from all remote speakers. The Millennium Central Tone Generator produces the 55 standard Adaptatone sounds and can store 20 seconds of field recorded voice messages. Four signals may be activated from field-wired, normally open contacts, or a 24V DC external voltage source such as an output of a PLC. Normally open contacts can be obtained from the Cat. No. 5538-4 or Cat. No. 5538-4R Adaptatone Signal Actuator. Messages and tones may be selected by setting miniature dip switches within the unit. The programmed tones operate on a pyramid-type priority system. For more information on priority tone operation and a complete listing of all 55 tones, see Adaptatone Tone Selection and Priority Operation. The 5540MV-485Y6 is designed to be connected to RS485 networks, allowing full serial signaling communication control. Adaptatone Signaling Systems are designed for industrial applications calling for high decibel output and microprocessor reliability combined with simultaneous signal delivery over all speakers included in the system. Typical applications include: emergency warning systems, plant evacuation alarms, shift start-and-dismissal horns & paging signals. Adaptatone "B" to Adaptatone Millennium Cross Reference. Battery Backup for Adaptatone Millennium Connecting an emergency battery backup system to an Adaptatone system using the Edwards EBPS6 power booster supply in combination with an MR201/C relay.